Jesuit missionaries reported their observations of peninsular California's magnificent rock art, but their writings were overlooked in the turmoil of their expulsion from all Spanish soil  and the worldwide suppression of their order, the Society of Jesus, in 1773. 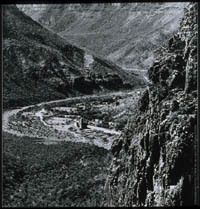 In the 1890s, Leon Diguet, a French chemist employed by the mining company in Santa Rosalía, rediscovered some examples and reported them in a scholarly journal. The phenomenon reached a broad public through a Life Magazine article in 1963 that was prompted by a report from Baja California aficionado and mystery writer Erle Stanley Gardner. 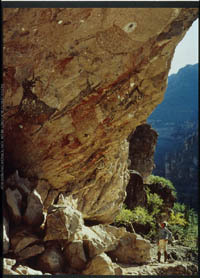 In 1975, my work, The Cave Paintings of Baja California, raised the total reported sites from about 30 to over 200. 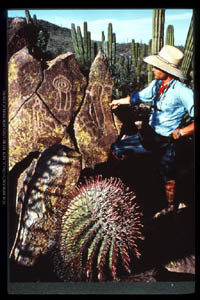 Since then, dozens of new sites have been discovered, mostly by local ranchers who had seen or heard of the attention that the art was receiving and the visitors that it attracted. Ancient hunters moved large chunks of basalt to form depressions screened from the view of the deer that they drove through passes in the rocky scape. Men armed with bows and arrows leapt up at the opportune time and had close shots at their prey. 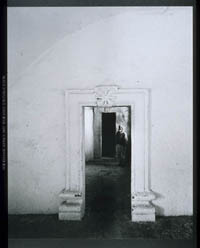 After the Jesuits established themselves at Loreto, Sicilian Padre Francisco María Piccolo yearned to found a California mission of his own, but knew he would have to find a site with solid promise for agriculture. He, Captain Tortolero, and eight soldiers headed southward on the Monday following Christmas of 1698. They reached Chuenque, then a rush-filled marsh back of the beach, and visited nearby Puerto de Danzantes (soon thereafter named Puerto Escondido). They found no large bands of people and no site for a mission. Moreover, the sierra that blocked all routes from the Loreto Plain appeared even more formidable as the party ventured south. Piccolo returned to Loreto convinced that his best path westward lay in the great arroyo that ascended directly from Loreto to a mountainous region called Viggé by Loreto's recent converts. San Javier was founded in 1699, the second mission created as the Society of Jesus finally established a permanent Spanish presence in California. The founder, Padre Francisco María Piccolo, led the exploration that discovered the original site on which San Javier was founded, but within a few years a lack of water and arable land forced a move to the site pictured here, some five miles downstream from the original. 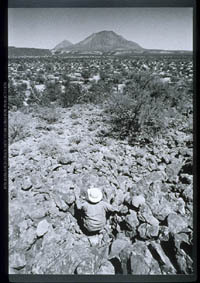 Misión de San Javier seen from a high mesa to the east, 1967. Beginning in 1744, Padre Miguel del Barco had a crew working at San Javier on a magnificent church of cut stone, apparently of his own design, and California's first to be capped by a vaulted roof. This building was not dedicated until 1758, in part because it took several years to obtain a maestro capable of supervising the delicate craft of cutting porous stone, tezontle, a vesicular basalt, and erecting vaults with crossing arches. In another more important achievement, Barco wrote the most valuable and extensive eyewitness account of Jesuit California, Historia natural y crónica de la Antigua California, one of the cornerstones of my current work, Antigua California. 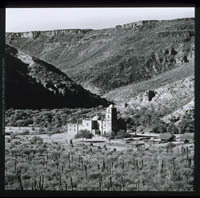 View of San Javier from the south slope of the arroyo, 1967. 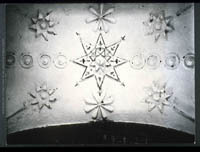 Plaster detail on the arch beneath the choir loft at Misión de San Javier, 1967. 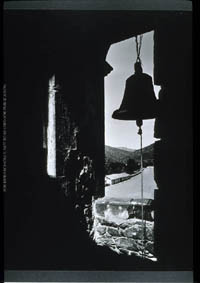 View from San Javier's belfry, 1967.